This entry was posted in Christian Life, Missions and tagged Christians, Compassion, Ebola crisis, West Africa by Barbara Lane. Bookmark the permalink. Wow. I do feel bad about this. I assumed it had finally petered out since it wasn’t in the news anymore. I was grateful, but, my gosh, it’s only gotten worse! Thank you for this update. I will certainly renew my prayers! 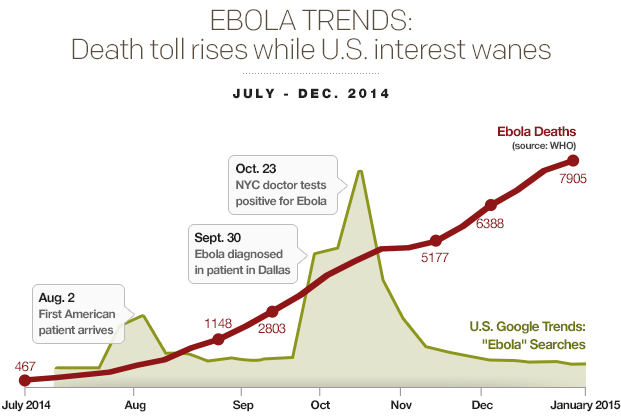 I can’t help but wonder if there ever really was an Ebola crisis. Something that big cannot just go away all of a sudden. Reminds me of the swine and bird flu. They were supposed to be big crises, and they just disappeared too, no explanation. Lyme Disease really is a crisis, but the US government and all its “health” agencies choose to ignore it and call patients names, like crazy. It is torture 24/7, with zero help from the medical community. The medical community hypocritically recites “do no harm” and with a pretense of having virtues, leave you to suffer. It is a crime!!! 300,000 new cases a year, per CDC in the US alone. Suffer, die, no one cares. Where is the Christian compassion for all these sufferers? Where is the love your neighbor as yourself? There was and is a crisis in West Africa. That is what I was writing about. And the crisis in West Africa has not gone away – it is just not being reported any more because it is not effecting our country – and we basically don’t care about anyone but ourselves.